Computer tomography (CT) is more sensitive than radiography for detecting early sacroiliitis. Erosion of the joint facets, joint space alteration and increased bone density (sclerosis) are considerably better visualised. However, CT is based on X-rays and can therefore only visualise abnormalities detectable by attenuation of X-rays, that is structural damage and not early active osseous or joint space inflammation. In addition, the radiation dose can be high if the examination is not optimised by a semi-coronal technique. The joint facets of the sacroiliac joints are C-shaped and placed obliquely. Using a semi-coronal slice orientation the number of images can be reduced and thereby the radiation dose. Semi-coronal and axial slice orientation in relation to the form and orientation of the joint facets. 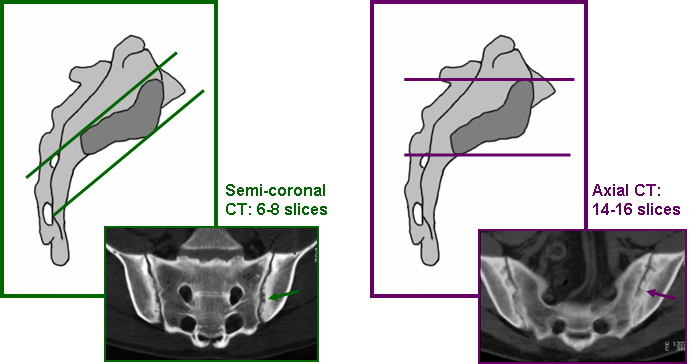 Erosive changes, joint space alteration and sclerosis (arrows) are seen by both slice orientations, but the number of slices is much higher by the semi-coronal than by the axial orientation.